Step on first step and step locks automatically engaging the rubber feet and locking the ladder to the ground surface. Step on pedal and the locking system disengages. 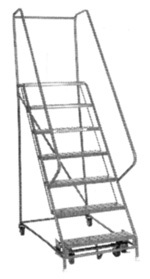 Retracts under weight of individual, then rubber feet drop down and grip the floor surface preventing the ladder from moving. Entire ladder is welded. Requires no assembly. Minimal assembly required. Guardrail and handrail assemblies fully welded. Assembly required. Ships completely flat for maximum freight savings. Perforated hole pattern and solid step provides excellent slip-resistance, self-cleaning and durability. Grip Strut provides the most aggressive slip-resistance and self-cleaning properties. Aluminum extruded tread with ribbed grooves provides a high level of slip-resistance. Optional Safety Walk solid step with anti-skid adhesive provides good slip-resistance and aesthetics. 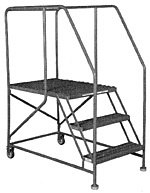 Adds additional working space to top platform for safety and comfort. Attaches to rear of ladder providing a convenient work surface. No tools required.